It guides you through the important elements of an effective report of findings. As you meet with the patient, use a red roller ball type pen to enter their name, date and reason(s) for consulting your practice. Check the exams you conducted and the significant findings you found. 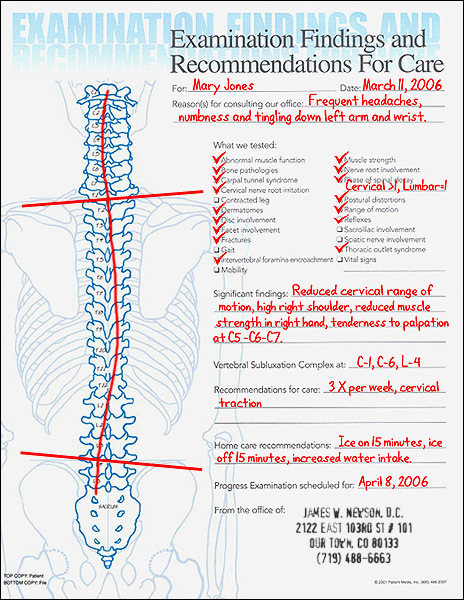 List where your exam found patterns of subluxation. On the illustration, draw any postural distortions, scoliosis, high shoulder or uneven hips your exam uncovered. Fill in your recommendations, home care instructions and the scheduled date of his or her first progress exam. Rubber stamp or sticker your practice information at the bottom. When completed, your exam form might look like this image to the right. You've just delivered a succinct and thorough report of findings that stays on message. When you're done, insert it along with your other report documents, in their VIP Report Folder. Save time and give your report of findings greater simplicity and impact.